This dish is….well, I don’t have words. This unexpectedly blew my mind! I found this recipe and then tweaked it a bit to what I had available and what I could find at the store, and this is what I came up with! I served it hot the first night I had it then saved the left overs and ate it cold the next day – both ways are DELISH!!! I also added chicken to it. Let me know how you like this one! Whisk together dressing ingredients and set aside. Take liberties with the dressing – add or subtract anything – I kind of throw it all in until it tastes good. Heat a large skillet over high heat. Add a few teaspoons of oil. When it starts to sizzle add the brussels sprouts, cut side down (or as many as you can get cut side down quickly), with a few pinches of salt. Don’t touch them for a few minutes until the cut-side starts to turn golden brown (turn one over to check). Once they have a good sear, flip them over, add the broccolini and continue cooking until tender, but not mushy. At the very end, toss in the already cooked chicken and cherry tomatoes. Transfer the vegetables and chicken to a plate, and let them cool slightly, then toss with a bit of the dressing. Taste and adjust seasonings. 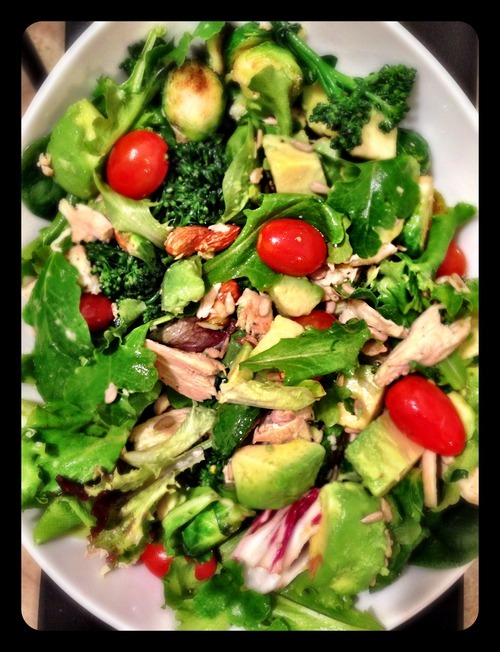 Toss the brussels sprouts & broccolini with the sliced avocado, almonds, lettuce, sunflower seeds. Taste & toss with more dressing. Serve warm, and with extra lime slices.